Natural Paper Additives | Sodium Alginate | SNP Inc. Sodium Alginate is extracted from naturally occurring seaweed, which is classified into four main groups: Chlorophyceae (green algae); Phaeophyceae (brown algae); Rhodophyceae (red algae); and Cyanophyceae (blue-green algae). Chlorophyceae and Cyanophyceae, which live in salt water, fresh water, soil, and tree trunks are used primarily in food. Phaeophyceae and Rhodophyceae, salt water plants available in large quantities, are important commercially because of their specific polysaccharide content. Agar and carrageenan are extracted from various types of Rhodophyceae. Algin acid is an anionic polysaccharide specific to seaweed. 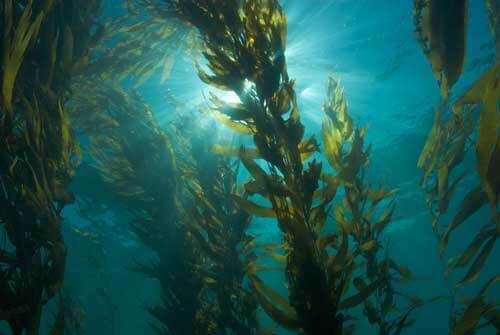 The primary commercial interest in kelp is its algin content with Phaeophyceae or brown seaweed being the main source of align which is found in the cell walls of the algae. Brown seaweed’s growth characteristics make it an ideal raw material because it grows in calm waters and in large dense beds. The plant is also a perennial so it can be harvested more than once a year. Besides algin, there are other ingredients in kelp including trace minerals, which are valued as a supplement in cattle feed or as fertilizer. SNP chemists and engineers use the algin processed from the seaweed to create sodium alginate, a granular powder, when fully hydrolyzed is capable of absorbing 200-300 times its own weight in water. These alginates, in their unmodified form, make up our C series alginates. The C series are sodium alginate products for use in papermaking, paper coating, textiles, printing and certain specialty industries. SNP alginates provide excellent water retention, reduced porosity for release grades and improved binder flexibility, improved pigment dispersion, increased coating thixotropy, and high quality fine line printing. The following products are in our C Series: S-15-C; S-50-C; S-160-C; S-500-C; and S-1300-C. They range in viscosity from 15 to 900 cps in a 1% solution (Brookfield viscometer, #3, 10 rpm, 25°C). The products are supplied as a cream/light tan granular powder of various molecular weights.